Melbourne Renegades will host the Sydney Thunder as a part of this intense combat for the top spots. The league stages of the Big Bash League 2018-19 is almost coming to a close. On an average, each team has got only about two to three games still left. However, the battle for the semi-final spots is still on and nearly five teams are competing hard for three spots that are still left. The Hobart Hurricanes have more or less made it through. Melbourne Renegades will host the Sydney Thunder as a part of this intense combat for the top spots. With seven wins in 12 games, another win could take the Renegades extremely close to qualification. 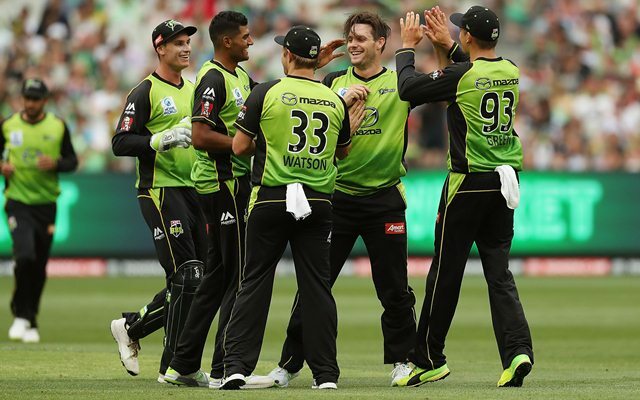 However, it won’t be as easy a task against the Thunder who registered a top-class win against the Perth Scorchers in their last game. The team stands fifth on the points table and needs at least two more wins to seal their berth in the semi-final. The Docklands Stadium in Melbourne, where this match will be played, isn’t a high-scoring venue. The pitch has got lots of assistance for the bowlers and the batsmen will have to work hard for every run that they put on. There is a forecast of rain throughout the duration of the match. Thus there could be several interruptions to the game. The last thing that these two teams would want it a washout. The Thunder have already been affected once due to the failure of floodlights. Cameron White misses out for the upcoming fixture against the Thunder. Hence, Beau Webster could take his place in the eleven. Aaron Finch and Sam Harper will have to play well at the top order. Moreover, Dan Christian and Mohammad Nabi have been doing well and will continue as the all-rounders. The bowling department will have no changes. Predicted XI: Aaron Finch (c), Mackenzie Harvey, Sam Harper (wk), Tom Cooper, Beau Webster, Daniel Christian, Mohammad Nabi, Cameron Boyce, Kane Richardson, Harry Gurney, Chris Tremain. The Thunder have made some changes to their squad from the last match. Wicketkeeper Matthew Gilkes injured himself during one of the training sessions. Hence, Baxter Holt will get an opportunity to make his debut behind the stumps. Arjun Nair and Jono Cook are also recalled into the eleven. Arjun might get an opportunity in place of Nathan McAndrew although the chances look bleak. Predicted XI: Shane Watson (c), Anton Devcich, Callum Ferguson, Jason Sangha, Baxter Holt (wk), Daniel Sams, Chris Green, Nathan McAndrew/Arjun Nair, Chris Jordan, Gurinder Sandhu, Fawad Ahmed. 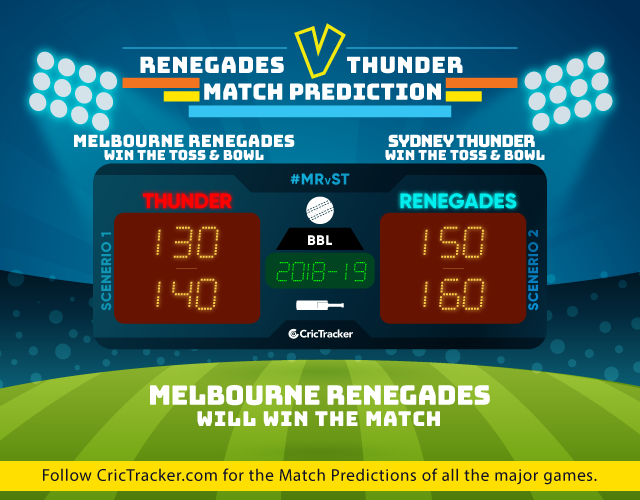 Considering the head to head record (Renegades – 7, Thunder -1), the Melbourne Renegades are most likely to win the match.